Resin Wicker has become very popular in recent years. This furniture is typically handmade in the same facilities as real wicker and rattan. The frames of these pieces are constructed of various types of resin that mimic the look of natural wicker and rattan but are made to resist moisture, UV light and other elements that would be harmful to natural materials. 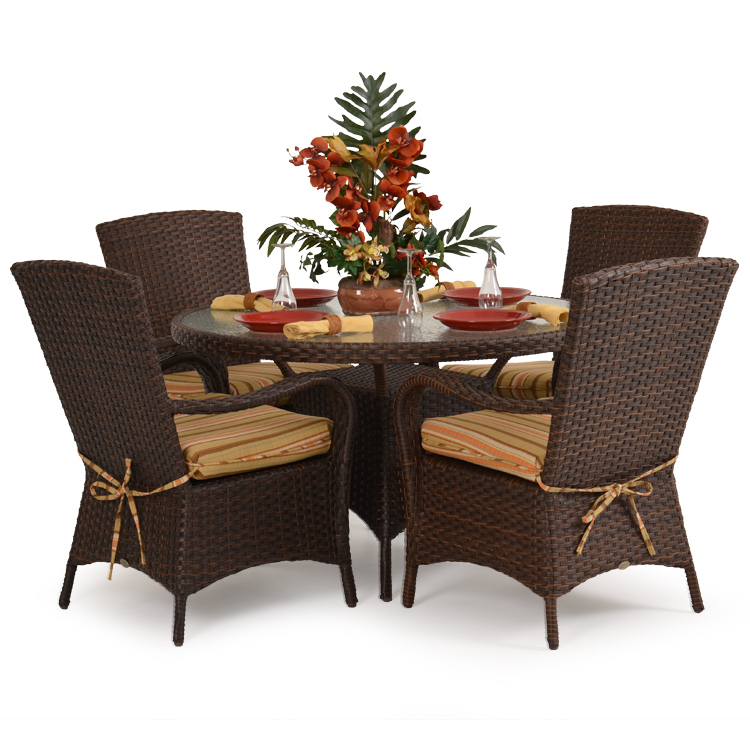 Resin Wicker patio furniture should last a long time and with proper maintenance, even longer! Here are some of the basic things that can keep your furniture looking like new. It is best to remove soiling and spills as they happen as they will be much easier to clean. This can be done by rinsing the product thoroughly with fresh water and brushing with a soft bristle brush. To remove stubborn dirt or stains from the frame or heavy soiling that has accumulated over time, clean the frames with warm, water and a mild soap. Brush with a soft bristle brush if necessary. DO NOT USE SOLVENTS, AEROSOL CARBON TETRACHLORIDE, SCOURING AGENTS, JANITORIAL CLEANERS, GASOLINE, METAL BRUSHES OR HARD PLASTIC BRUSHES TO CLEAN YOUR WICKER. THESE SOLUTIONS/UTENSILS WILL BREAK THE INTEGRITY OF THE WICKER DOWN AND POSSIBLY CAUSE IT TO BECOME STICKY. DO NOT MACHINE WASH OR MACHINE DRY THE CUSHION CASINGS/COVERS. DOING SO MAY DAMAGES THE SEAMS OF THE CASE OR EVEN SHRINK THEM, MAKING IT IMPOSSIBLE TO RESTUFF WITH THE CORE!